I’m sure most people already know, but just in case, that quote is from Lewis Carroll’s Alice’s Adventures in Wonderland, one of my favorite books. And this is a 1660’s painting of a cabinet of curiosity by Johann Georg Heinz. I’d never even heard of cabinets of curiosities until I read this great escapist, but smart book by Douglas Preston and Lincoln Child called The Cabinet Of Curiosities. I might have mentioned these two before. I’m on the last book of a series that they wrote together. I’ve enjoyed them all, but I would only recommend The Cabinet Of Curiosities and another called Brimstone. But I would recommend them very very very highly. 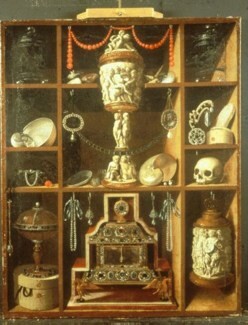 Cabinets of curiosities were basically collections of objects by amateur scientists that were opened up to the public. Here’s a description on Wikipedia. The more bizarre the man, the more bizarre the cabinet. Which reminds me, before I forget, I saw Pan’s Labyrinth. I didn’t really care for it! It’s the highest rated movie on Metacritic, but while there were some things I liked, it wasn’t complicated enough for me, and the fantasy elements weren’t convincing somehow. I don’t want to say much more and spoil it for anyone else. Last, I have become completely obsessed with American Idol. I only just started watching a season or two ago, but man. What a fun obsession. Maybe I’ll post about it tomorrow. But if anyone knows a great American Idol blog, please tell me. I like this blog, Hold Your Applause. He writes about more than American Idol, but it’s worth checking out. I wonder if the 1920 German film “The Cabinet of Dr. Caligari” was in any way inspired by these much older cabinets of curiosities, since I think the evil doctor in the film is touring ‘curiosities’ at a carnival when the film begins. Apparently this is the first horror film. A very funny and *very cynical* bulletin board relating to the American Idol franchise machine is votefortheworst.com —But you have to be prepared for the dark side of AI. I always read it after each episode. I heard about votefortheworst.com I have to go look now. And I will bet that the Cabinet of Dr. Caligari was a cabinet of curiosities. Now I have to see it (I’m not sure if I ever have).